This was a complicated fun DIY project (or shall I say DYI as in Do Yourself It, see last photo for reference). Don't make fun, I think I am slightly dyslexic...I am not perfect people-- ok ok you can make fun, I am ok with it, I laugh myself. Back to the subject, I was looking forward to this project I set out to do for you all but when I began doing it I realized how time consuming it was. I didn't anticipate seating there doing it for almost two hours, yes you heard me two hours, but I knew it was going to be worth it. 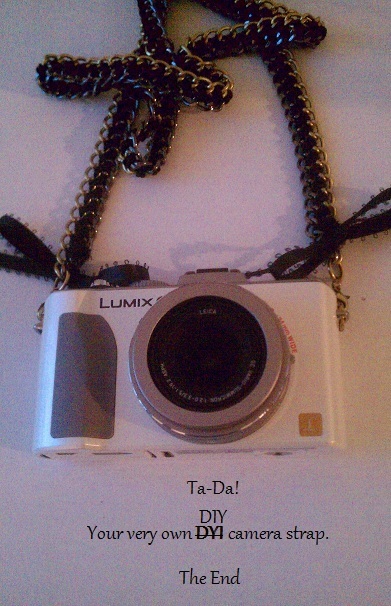 I wanted a chic and fun little camera strap and I achieved it. I hope you liked and that it is easy to follow, that is...if you decide to be as crazy as myself and do one for yourself. BTW, you can find all supplies at your local craft store like Michael's. Advise: make sure you get a clasp that is large enough to fit the loops of your camera, otherwise you will need two additional large jump rings to place on the loops of your camera so that you can connect the clasp to your camera...I had to do that (my clasps where small).